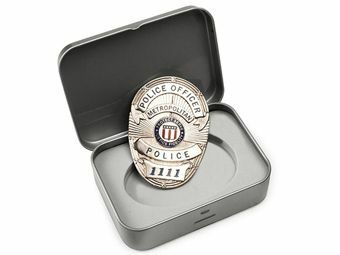 If you are looking for a cheap yet effective gift idea for a policeman then the METRO POLICE Badge W/GIFT BOX is the ideal gift idea for you. This metal finish gift box comes in a nice square shape. Inside the box an elliptical police badge is there. This badge is a silver finish metal badge with police emblem engraved on it. With sturdy engraving the badge displays “POLICE OFFICER METROPOLITAN” above the emblem and POLICE 1111 engraved below it.